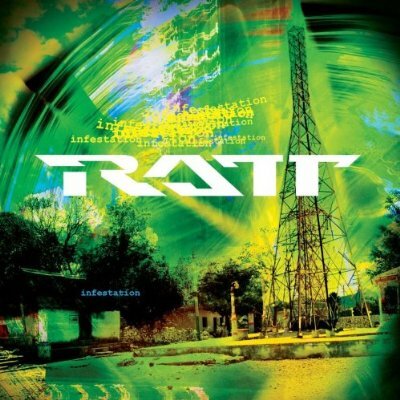 RATT – “INFESTATION” RELEASES APRIL 20, 2010… I’M IN!! 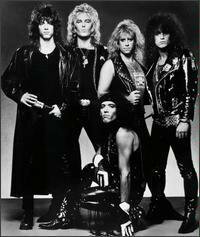 RATT – Yes, I have that Metal fondness for RATT. Always have. Plus, I’m a big fan of the late Milton Berle too, his appearance in the Round And Round music video only made it that more cool. Stephen Pearcy’s “other” band Arcade is unreal great… for me. I inhale the debut and self titled Arcade album, from 1993, like it’s Heavy Metal oxygen. My favorite RATT album ever, is Out of the Cellar, from 1984. This Out of the Cellar album is super loaded with one memorable song after another. Metal be thy name. LIVE AND LET METAL LIVE. On or about April 20, 2010, I will obtain a brand spanking new CD of Infestation… and be damned glad I did. Will I like every song? Will I be disappointed for whatever reason? I cannot predict the Metal future. 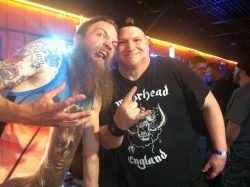 I’m not the Metal Nostradamus. I am anticipating, however, a bona fide and downright credible album from a group of musicians who know a thing or two about Hard Rock and Heavy Metal. Look, for the nay sayers on the upcoming RATT release… it could be worse, there could be a brand new ABBA album coming out on April 20, 2010 instead. Worse yet, a CD/DVD deluxe edition of Jim Nabors could have been released as well. Think about those two chilling thoughts for a moment. Double whoa. I just thank God each and every day that Hard Rock and Heavy Metal exists… period. This is RATT 2010, not some quickly put together, televised talent show winner that can’t remember their lyrics. Ever since the Out of the Cellar album came out back in 1984, I seemed to have been imbedded with the sound of RATT ‘N’ ROLL. Back on May 19, 2009, I blabbed up and down, just how this RATT album brought great Metal joy into my teenage life back in ’84 . Check it out by clicking on the header below… if you like. LONG LIVE RATT ‘N’ ROLL! KEEL – 1987 ALBUM “KEEL” STILL PACKS A HEAVY METAL PUNCH! When I think of the 1980’s, good times, carelessness, more parties than I can count or remember, no mortgage payments and sleeping real late comes to mind. Hey, why not? It’s all a part of growing up and it all led me down the path to where I am now… and I’m not complaining, I have the best family money or Metal can buy. So when I reach for the albums that remind me of good times, KEEL , (self titled), from 1987 puts a grin on my face and still psyches me out. 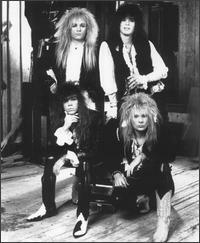 So Metal be it… KEEL is one of my favorite Hair Metal Bands from the loud, proud and colorful ’80’s. I still have the CD version of KEEL from 1987, liner notes and all. Yes, the liner notes are very important to old school Metalheads like myself. All 10 songs on KEEL are packed with Heavy Metal punch… regardless of KEEL’s Hair Metal tag from that era, it’s all Metal relative. The underlining characteristic of KEEL, is this album has power. Two songs that exemplify this power adjective the best on KEEL are: Somebody’s Waiting and Cherry Lane, plus they are back-to-back… tracks 2 and 3. Does it matter if this was not the hottest selling KEEL album from their catalog? Not in my Metal opinion, at this point in time… does it really even matter? At the end of the Metal day, it’s all about personal preference and opinion anyways. What once was old is new again… and what albums that did not sell off the shelves, are now being discussed again for those who want to seek out and give a listen to. Going back to Cherry Lane… you won’t find or hear a better tongue-in-cheek Heavy Metal song than this! Cherry Lane is a (gasp) fun song that makes me, (gasp), chuckle a tad almost 25 years later. I’m not embarrassed to admit liking some “fun” in my Hard Rock or Metal. (Hello, David Lee Roth). Calm Before The Storm is a ballad… my finicky side for ballads approved of this song a long time ago. This ballad has a tempo that isn’t so slow you want to scream, it flows very well and lyrically never made me cry and stay in bed for a week… so I have always been down with this song. 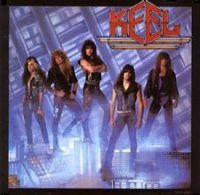 The strong vocals of Ron Keel and the chorus from KEEL is what adds to this band’s powerful identity. 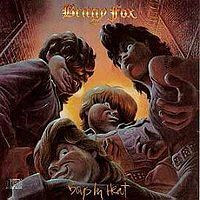 Marc Ferrari and Bryan Jay on guitars, fuel KEEL with numerous addictive licks on this album to make these songs not just hard & heavy, they also made them memorable going on 3 decades. Toss in a smash ’em up rhythm section of Dwain Miller on drums and Kenny Chaisson on bass guitar and yes Virginia, KEEL delivered a potent Heavy Metal album here. If you are into ’80’s Hair and Heavy Metal and never bought this album, seek it out and give it more than a test drive… crank it LOUD with the car windows down… going at a reasonable speed of course, please. KEEL was released on June 21, 1987, on MCA Records. This was the fourth album release from KEEL. I have forever and always will be an admirer of Michael Schenker, the lead guitarist of The Michael Schenker Group, McAuley Schenker Group, UFO and of course, an original guitarist for the Scorpions. Michael Schenker has also released numerous albums through a solo career and side projects. 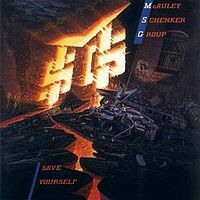 McAuley Schenker Group – Save Yourself, was a choice Metal pick of mine today… I reached for this CD and let it’s Heavy Metal engulf my ears. Released on October 25, 1989, Save Yourself was an instant Metal favorite for me since it’s release. Always the impeccable Metal guitarist, Michael Schenker, through his signature sound, is such an amazing standout figure in the history of Heavy Metal… in my Metal opinion. Is this the greatest Michael Schenker guitar led album ever? Not necessarily, yet Save Yourself does come across with it’s melodic Metal power – amazingly well for my liking. This is an album that I have never grown tired of, nor ever will. Is Robin McAuley my favorite vocalist on a Michael Schenker album? No, Gary Barden is, that is not an insult to Robin McAuley, it’s just my personal choice. I really like the vocals of Robin McAuley, Old School and never overreaching. Metal Odyssey Warning: There is NOT one bad or sub-par song on Save Yourself, in my Metal opinion. Seek out this album and listen to it at your own Metal risk… you just might find yourself liking this album a great deal. I Am Your Radio is a prototypical 1980’s Heavy Metal anthem. With its heavy stomping and power driven rhythm section, accompanied with a backdrop fused with all the electrifying guitar leads and riffs you can ask for… throw in a climactic solo for good Metal measure too. Can this song be construed as ’80’s corn dog? Not in my Metal mind… especially when this song is played LOUD, like it was meant to be heard. What We Need is an engaging Heavy Metal song, strong vocals from McAuley and muscular guitar licks from Schenker abound. Shadow Of The Night is rich with it’s Heavy Metal chorus, a true ’80’s melodic anthem, a sing-along for MSG die hards! There Has To Be Another Way is the lone instrumental on Save Yourself. This is not Michael Schenker showing off, no ego is prevailing here… just a bitter sweet sound of emotion being spoken from his flying V. (As fine of a mellow/Metal guitar instrumental I’ve ever heard). Get Down To Bizness has the attitude and flamboyancy that late 1980’s Heavy Metal was so notorious for. Combine the vocals and solo of this song and you have a molten ball of Heavy Metal, raging with all the greatness of this era’s heavy music. Anytime is a power ballad THAT I EQUATE TO HEAVY METAL GREATNESS. That is correct… a ballad that I revere!! Wow, there really are Heavy Metal ballads that get Metal recognition on Metal Odyssey after all! Simply put, Anytime with it’s lyrics, melody, tempo and complete musicianship… is an all time favorite song of mine… period. Anytime gives me salamander bumps up and down my arms and across my face, each time I hear it. (Don’t repeat this to anyone… you all MUST Metal promise!). Bad Boys gets the adrenaline flowing on high, it’s not a knock you out song, it’s just a song that has bite with raw undertones. Besides, Michael Schenker makes good on his guitar solo on Bad Boys, regardless of how shortened it is. Save Yourself as the album opener, opens with Michael Schenker letting it be known he is THE guitar god on this album and with his band. Save Yourself is arguably the heaviest song on this album. Take Me Back is the last song on this album, it is almost like Robin McAuley and Michael Schenker wanted to save one of the best for last… for Take Me Back IS one of the best songs on Save Yourself. A commercially accessible song is Take Me Back, still it is Heavy Metal with Michael Schenker leaving his signature – guitar stamp of approval all over it. Steve Mann, not to be ignored, plays alongside Michael Schenker on this album and my ears hear his credibility throughout, both on guitar and keyboards. Save Yourself was originally released on Capitol Records. Faster Pussycat debuted their self titled album back in 1987. Sure, I gave Faster Pussycat a listen back then, they were never a #1 favorite of mine, still this band Rocked – and they still Rock to this day. Nonetheless, I still find time to give this band a listen. I recall Faster Pussycat being a cool party band to rock out to, back in the late ’80’s. Faster Pussycat was tied into the Hair Metal genre, right out of L.A., yet I always had the sense that this band was a bit more edgier and heavier to be pigeon holed into that genre. I just stamp the old Heavy Metal label on this band and I am done with it. This group does deliver a whole bunch of Heavy Rock & Roll with their sound, Taime Downe on lead vocals is a sliver reminiscent of Marc Storace of Krokus fame, (in my Metal opinion). Why I say Heavy Rock & Roll when I describe the music of Faster Pussycat is for really one valid reason… the piano that is at times featured in their songs. “Cathouse” is a great example of when you hear the Rock piano getting it’s fair usage. Without ever knowing this band, I can hear influences from the legendary Aerosmith, Taime Downe really does remind me of Steven Tyler on “Slip Of The Tongue”. “Don’t Change That Song” was and forever will be the catchiest song from Faster Pussycat… for me. The lyrics are borderline humorous and very memorable. “Don’t change that song, it’s my favorite record”… these are simple lyrics that just stick in my head and have me asking… how did these guys come up with this song? “Where There’s A Whip There’s A Way” is a super cool and trademark Hair Metal song, if there ever was one. “You’re So Vain” is the cover song found on this “Greatest Hits”, (written and sung back in the ’70’s by Carly Simon). Let’s see, the controversy starts now… do I like the Faster Pussycat version of “You’re So Vain or the original Carly Simon version? Well, this is one of those circumstances where I pick the cover version over the original… Faster Pussycat wins. Trust me, Faster Pussycat does not cover this song as a ballad, they make it Rock heavy. (It’s my personal Metal preference with liking this cover song over the original). “Bathroom Wall” is another substantial song to mention here, it just flat out Rocks along without hesitation. This song is what I always like to refer to as – a good time – let’s party, Heavy Metal song. “House Of Pain” is the lone ballad on this “Greatest Hits”. I have never been a fan of Heavy Metal ballads, I have always been rather picky about them. Yeah, I have a handful of my own, personal favorite, Heavy Metal ballads from years, (gulp), decades past. “House Of Pain” is not a song that I will jump up and down about, however, it probably was the biggest hit that Faster Pussycat ever had. (All the Metal power to them). This is a darn cool CD to pick up if you don’t have any Faster Pussycat in your Metal collection, all the hits are covered, ten in all. I bought this CD at Walmart a few months ago, for five bucks. (Not too shabby of a price for the tunes). The original Faster Pussycat lineup, circa 1987: Taime Downe on lead vocals, Brent Muscat on guitar, Mark Michals on drums, Greg Steel on guitar and Eric Stacy on bass guitar. As a side note, Taime is pronounced – “Tie Me”. Uh, just in case there is anyone out there that did not know this. Faster Pussycat “Greatest Hits” is on the Flashback record label. This label is known for the numerous Greatest Hits CD’s they put out – showcasing Heavy Metal bands from the past.